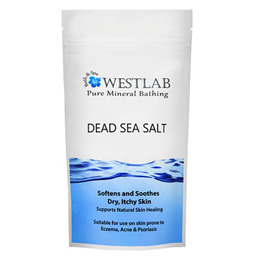 Westlab Dead Sea Salt softens and soothes dry, itchy skin. Supports natural skin healing. Suitable for use on skin prone to Eczema, Acne and Psoriasis. Naturally rich in Magnesium, Calcium and Potassium. Established in 2004 Westlab are the UK`s leading mineral bath salt experts, trusted to source only high quality, genuine Dead Sea Salt. From the depths of the Dead Sea, these mineral-rich salts have been renowned for their therapeutic benefits since ancient times. Unrefined and cleaned without the use of harsh chemicals or bleaching agents, Westlab’s genuine Dead Sea Salts soothe dry, itchy skin and are suitable for use on skins prone to Eczema and Psoriasis. 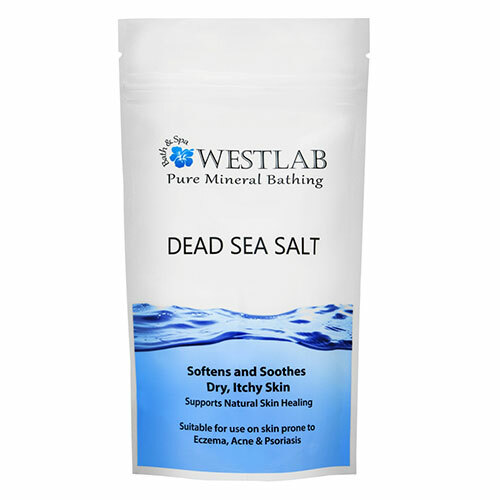 Westlab’s Dead Sea Salt contains Magnesium: helps soothe, protect, balance and repair the skin, Calcium: an anti-oxidant and cell-renewing, and Potassium: balances the skin`s moisture levels. Maris Sal (Dead Sea Salt) Chemical Composition: Magnesium Chloride, Potassium Chloride, Sodium Chloride, Calcium Chloride, Bromide, Sulphates, Insolubles, Water of Crystallization. Bathing instructions: Dissolve salts in a bath of 37-39°C. Relax and soak for 20 minutes. To help soften and soothe dry, itchy skin use 500g-1Kg. For general skin health and wellbeing add 100g-250g to your normal bath. Seek GP advice before using if you suffer from a medical condition or for use on babies or children. Below are reviews of Westlab Dead Sea Salt - 5kg by bodykind customers. If you have tried this product we'd love to hear what you think so please leave a review. really makes a difference to my skin. I use it in the bath every morning and use less steroid creams now. Good packaging and delivery. The product quality not as good, but it does what I need it to do, after you break the lumps apart. Fast delivery well packaged. Don't know what I was expecting but the first time I used it I was amazed. The water was silky soft and made your skin feel so smooth - heaven! Good packaging and delivery. The product quality is good, and it does what I need it to do. Fast delivery, great price. Good product, excellent for dry skin. Very delighted with the order. Arrived on time & was at a reasonable price. Great stuff, you can literally feel aches and pains dissipating and it leaves your skin silky soft. Love it! I have used this product before, but the price here, was unbeatable. I used to get it in 1kg bags but because of the price opted for 5kg. My only complaint is the weight of the package I had to collect from the PO! I love the sturdy, resealable bag it comes in. It's a great addition to any bath but really good with some essential oils. Can't recommend it highly enough. Softens and soothes dry, itchy skin. Supports natural skin healing. Suitable for use on skin prone to Eczema, Acne and Psoriasis. Westlab only source the highest quality Dead Sea Salt. Naturally rich in Magnesium, Calcium and Potassium.